First and foremost, we hit all the right spots when it comes to being ideally positioned. Our recently refurbished practice is located in Glasgow’s West End, making us super convenient for city dwellers and easily reached by those who live in the surrounding areas. Rest assured, our UK qualified dentists have years of experience, treating all kinds of patients and all manner of dental cases. As well as experienced dentists, we also have two very friendly hygienists who will deep clean your teeth and make sure your gums stay healthy. We can offer an impressive range of innovative orthodontic treatments including Damon Braces, Invisalign, Inman Aligner, Six Month Smiles, Simpli5 and STB Secret Smiles. These are adult-friendly alternatives to traditional braces as they often have speedier treatment times and are much more discreet to wear. As well as bridges and dentures, we also offer dental implants to fill in those embarrassing gaps and these are expertly placed by a practitioner with oodles of experience. If you want a more beautiful smile, we can provide a range cosmetic pick-me-ups including Lumineers, Snap on Smiles and Enlighten Teeth Whitening. Want to find out if any of these top treatments will suit you – we offer FREE cosmetic, implant or orthodontic consultations. And our treatments don’t stop with your teeth, we also offer fab facial rejuvenation with dermal fillers, anti-wrinkle injections and Oralift (an effective exercise device to make your face look younger). We can administer sedation to calm the nerves of more anxious patients who may be concerned about having dental treatment. So don’t worry, be happy! Concerned about the cost? We offer 0% finance or you can join our Denplan payment plan scheme for handy budgeting. Busy working 9-5? We offer convenient evening appointments. We close at 6pm on Monday and Thursday, 7pm on Wednesday and 7.30pm on Tuesday. And you can easily make an appointment using our online booking system. And on top of all this, you can be sure that you will always be treated with kindness and respect, and consistently receive the very highest standards of care. Impressed? 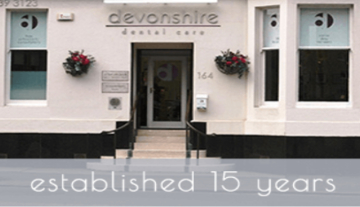 You will be – so give us a call on 0141 339 3123 and find out how to join Devonshire Dental. Free whitening and removable retainers (in total worth £511) with every adult orthodontic case! All the treatment photographs on our website are from actual cases we treated at our practice.